Former Men's Institute/Reading Room. Photo A. Curtis 2010. Towards the end of the 1800's the need for education was becoming appreciated and reading was becoming a popular pastime, particularly for miners, many of whom had free time during the day. 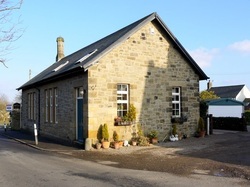 After several attempts to offer a Reading Institute, initially in a disused cottage and later in the school, a purpose built building was established. The Men's Institute was built around 1897/98, by Messrs Hunter of Hill Head, Houghton and was presented as a gift to the village by Mr. Richard Clayton of Wylam Hall. The institute was used as a focal point of the lives of the men and youths of the village. They gathered to read, play billiards, cards, dominoes, chess, draughts and darts. The membership fee was three pence per week. During the second world war it became the headquarters of the ARP service. After the war finished it was not possible to renew interest in its continuing use, and it closed in 1954. 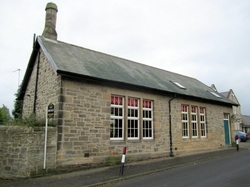 A Public Meeting was held in 1957 and ownership of the Institute was transferred to the Parish Council, who carried out some renovation work and converted part of the building into a library. notes from a meeting of the Association of Assistant Librarians, Northern Division, Heddon on the Wall, 13 April 1978. A library service was started in Heddon in the 1930s, based on a centre in the village. A weekly delivery was made to the local school, and villagers would call on Monday evenings to return and choose their books. In 1959, the service had grown and the library moved into a room in the Knott Hall, where a collection of 800 books served 49 regular readers. In 1962, the library had outgrown this room as well and a larger room was made available in the Mens' Institute. In 1966, the first paid employee was appointed to Heddon Library, a part-time assistant. The present library of 2000 square feet was built in 1974, and cost £40,000 on a site landscaped from scrubland. The stock in 1978, comprised some 6000 volumes, including 300 reference and 1500 children's books, serving a local population of 2000 . When the new purpose built library was opened in 1974 the Parish Council sold the building which was converted into private living accommodation in 1978. The proceeds of the sale are held in a Trust Fund for the village. Opening of Reading Room in Heddon on the Wall (1852). Newcastle Guardian and Tyne Mercury - Saturday 10 July 1852 page 8. The century in which we live is remarkable amongst other things for the spread of education. In the memory of many now living there were numbers of the working classes unable to read or write, and they could sign the marriage register and other documents only by making a cross. But village schools were established in almost every parish in the kingdom, and the children received instruction in those useful and, for a civilized people, necessary arts - reading, writing and arithmetic. As this knowledge increased the means of exercising it became desirable, if not absolutely necessary. To meet the growing want and to furnish the people with wholesome and instructive literature, some of the clergy, aided by their wealthier neighbours, started Reading Rooms in their parishes, making use of such buildings as were ready to hand, generally the schoolrooms. It was so at Heddon. The first Reading Institute was formed through the exertions of the Rev. John Blackett. After existing some years subscribers fell off and the Institute came to an end. It was revived about ten years ago by the Rev. C. Bowlker and some of the parishioners and C.J. Bates, Esq., was elected President, the school room being used as the reading room. This, however, did not meet the wants of the miners, who have often a large part of the day at their disposal. The members asked for, and obtained from John Clayton, Esq., a disused cottage which they fitted up as a temporary Reading Room. But in the year of the Queen's Jubilee, Mr. Clayton expressed his intention of erecting a suitable building; accordingly, on June 21st, the foundation stone was laid by Mrs. Bates and Mrs. Bewicke. The building was completed in the following year and opened by Mrs. Bewicke. At the same time, Calverly Bewicke, Esq., presented the Institute with £10 worth of books. The room is above fifty feet long, wide and lofty, and is lined throughout with varnished wood. It is divided into two rooms by a moveable partition, and is well supplied with books and newspapers, also with the means of amusement in the way of bagatelle, draughts, chess, etc. It is well and comfortably furnished, Messrs. Bates, the President, and Bewicke having each generously contributed £20 for that purpose. The library contains books to suit all tastes - works on history, biography, science and travels and also novels, some of them by the best authors. One hundred volumes were added to the library this spring. The library is for a moderate subscription available to the whole parish. The time of exchanging books, according to the present arrangement, is Tuesday evening, between the hours of 7 and 8. The youth of Heddon have now an opportunity of improving their minds such as their forefathers never possessed; it is to be hoped that they will fully avail themselves of the advantages they enjoy. This appears to be a legal transfer of the Institute to local residents who were to become Trustees of the Institute.